Sail back in time to capture the bygone days of a highly romanticized period in Key West sailing history when merchant ships, smugglers and pirates plied the very waters we sail today. The Jolly II Rover, with plenty of seating, smooth ride, and signature red sails will ignite your passion for traditional tall ship sailing. Join the crew and hoist the sails or sit back, relax and take in the experience. The best deal in authentic Key West sailing! Drink and eat what you want – bring your favorite food and beverages while we supply the bottled water, lots of ice, ice chests, cups and bottle openers. Sailing daily out of the Historic Seaport of Key West on Key West’s longest day sail with a Hint of Piracy! A full 2 hours on the water, your Key West sailing tour departs from the Historic Seaport (locals call it the Key West Bight). The Bight was famous for its shrimp boats and is rich in history and waterfront culture. On reaching open waters, Jolly II Rover’s distinctive red sails unfurl as you take in Mallory Square, Civil War era Fort Zachary Taylor, the Navy Mole submarine base, Truman Annex with President Truman’s famous “Winter Whitehouse”, Christmas Tree Island and view Sunset Key with its fabulous homes of the rich and famous. Key West’s waters teem with wildlife. Look for dolphins, turtles, flying fish, manta rays and man o’ war jellyfish. Overhead, frigates glide high above you while pelicans bob on the calm, warm waters and ospreys dive bomb for fish. Find your inner pirate while sailing Key West’s emerald waters. Join the crew and show your muscle hoisting the sails! Grab the wheel and prove your salt steering the ship! Let your intrepid spirit shine and fire the cannons! 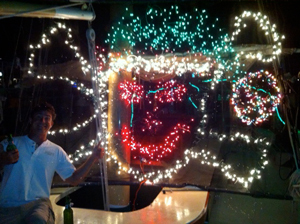 At only $45 for adults, a Jolly Rover day sail is one of the most affordable Key West activities! Book your day sail now! A must-do for all Key West trips is to soak in the sunset Key West style – from the decks of our majestic tall ship. Our Key West sunset sail, like our day sail, departs from Key West’s Historic Seaport. Be the focal point of Mallory Square’s World Famous Sunset Celebration! As we sail by, cameras flash as another evening’s worth of pictures are snapped of Key West’s most photographed schooner. Watch, wave and smile as other vessels sail in close to give their passengers a glimpse of our magnificent sailing ship with its distinctive tanbark sails and tall square rig. Sunsets in Key West are one of life’s most romantic moments. Picture yourself and your loved one sharing this exquisite view aboard the Jolly Rover. This experience is sure to be the highlight of your trip! Take in the beautiful sights as we sail past historic Fort Zachary Taylor, the submarine base, the Truman Annex – President Truman’s “Winter Whitehouse”, “Christmas Tree Island” and the celebrities’ multi-million dollar homes on glamorous Sunset Key. Watch for numerous Florida wildlife – dolphins, turtles, flying fish, pelicans, frigates and ospreys are just a few of the creatures inhabiting our emerald waters. As you sail into the glorious Key West sunset, scan the horizon for the world renowned Key West Green Flash – that elusive split second where the disappearing sun changes color. Let out your inner-pirate as the Rover crew trains the cannons and prepares for a broadside cannon fire exchange with a rival tall ship! Of all the beautiful sunsets you’ll experience in Key West, the most memorable will be from the decks of the Jolly Rover. Book Your Sunset Sail Now! Experience this Salty adventure by Land and Sea. This tour will feature some hearty tastings of classic locally inspired Surf and Turf Food and Drink rations to satisfy your hunger and thirst. You will spend 2 hours on land and 2 hours at Sea accompanied by your local Salty Guide who will bring to life the past and present beauty, simplicities and complexities, the colors and the characters of The Historic and The Iconic Key West Florida. You can help raise the red sails and partake in the firings of the cannons onboard the Jolly II Rover or just relax and watch the unfurling of the awesome crimson sheets on this Pirate ship replica as you take in the sights of the Historic Seaport, Sunset Key, Christmas Tree Island and the rolling postcard coastline of Key West and seize a view of Fort Zachary Taylor from the safe harbor of The Gulf of Mexico. This Will Not Be Your Average Sail, Nor Your Average Key West Crawl! This will be an unforgettable afternoon of food tasting, drinking, sailing and off Duval crawling with a hint of Piracy! Also: Inquire about our personalized Group Tours and Pirate Theme Weddings. Book Your Combo Tour Now! The Jolly Rover offers a number of special event sails throughout the year. If you don't see the event listed, take a look at our calender and find out exactly when the fun starts! Join the Crew of the Jolly II Rover and parade through the Historic Seaport of Key West showing off the ships holiday decor! Enjoy a starry night, a festive atmosphere and thousands of twinkling lights on this entertaining evening cruise. Bring your own choice of food and beverages, bottled water snacks of crackers and cheeses included. A Full Moon Like You Have Never Seen Before! Join the crew of the famous Schooner Jolly II Rover for an exciting, unforgettable full moon sailing experience in the glistening waters of the Florida Keys! Experience the pleasure and tranquility of night time sailing while basking in the amazing views of a Key West full moon. Engage In A Classic Sea Battle! Join the crew of the Schooner Jolly II Rover for this very exciting and famous, annual Battle of the Schooners!! Re-enactors in period costume will be onboard as the Schooner Jolly II Rover defends its position in the harbor against opposing forces from both land and sea! This is a very popular and very exciting event. Seating will be limited to 16 passengers and ear protection will be provided to all passengers. The Wreckers Race Is On! The "day of wreckoning" reenacts times in Key West history when wreckers raced to a disabled ship, rescued the crew and laid claim to the cargo! Today, there is nothing to rescue except bruised egos from the last race. Join the Schooner Jolly II Rover for a day of rivalry, fun and radio insults on the high seas! Enjoy an exciting sailing adventure among a multitude of sailing vessels all competing for fun! Stargazing Sail in the Florida Keys! Enjoy an exciting, romantic, sailing adventure while looking up at the stars! Away from all light pollution, watch the sky come alive as your eyes adjust. Elio Hinds, the schooners official on board star tracker, will teach you all about the solar system, galaxies, and beyond! Experience how the ancient mariners used the stars to chart their course, Identify constellations, and spot your Zodiac sign!